If you think this dolphin looks furious — it is — and with good reason! This colorful kiddie ride comes courtesy of gleeful art prankster Banksy, an artist well known for his graffiti and politically charged installations. In his most recent creation, the artist transformed a coin-operated ride into a searing statement against the BP oil spill. 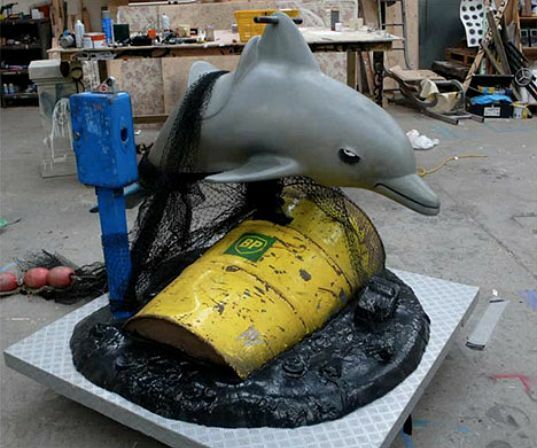 Wrapped in a real tuna net and fully oiled, this dolphin is fully operable, and ready to take you on a ride that’ll get you forgetting about all the eco-damage BP has done — and like BP, all you’ve got to do is throw some money at it. Watch a video of this mereswine in motion after the jump. If you think this dolphin looks furious -- it is -- and with good reason! This colorful kiddie ride comes courtesy of gleeful art prankster Banksy, an artist well known for his graffiti and politically charged installations. In his most recent creation, the artist transformed a coin-operated ride into a searing statement against the BP oil spill. Wrapped in a real tuna net and fully oiled, this dolphin is fully operable, and ready to take you on a ride that'll get you forgetting about all the eco-damage BP has done -- and like BP, all you've got to do is throw some money at it. Watch a video of this mereswine in motion after the jump.